Building and maintaining a subscriber database can get tricky. So we’ve built segmentation and POPIA-compliance tools into Everlytic to simplify your database management process and reduce duplicates. Our powerful API can connect Everlytic with your CRM system, enabling you to import contacts from existing databases automatically, and keep all your contact data in one place. Segmentation allows you to create groups of subscribers based on almost any variable, including interest, location, or personal information that you’ve collected. So that you can create hyper-personalised content that’s always relevant. 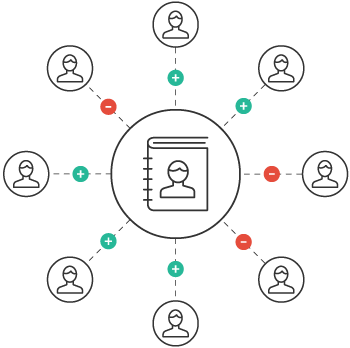 Everlytic protects you from sending the same person multiple versions of the same message by ensuring that each contact in your database has a unique identifier. This takes the hassle out of updating their information and detecting duplicates. It also means that only new or changed fields update with new imports. We’re proud of our proactive approach to international privacy legislation, giving you the tools to comply with POPIA, the GDPR, CAN-SPAM, and more. Everlytic protects you from sending the same person multiple versions of the same SMS by ensuring that each contact in your database has a unique identifier. This takes the hassle out of updating their information and detecting duplicates. It also means that only new or changed fields update with new imports.